A dental implant is a small part made of titanium or titanium zirconium which is placed in the jaw bone in place of the missing natural tooth root. 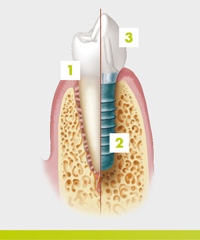 The implant can be surgically inserted under local anaesthetic on an outpatient basis. Titanium is generally well-tolerated by the human body and bone has been shown to bond well to titanium. Once healed, the artificial root acts as a base for fixing individual crowns and multi-tooth bridges. The implant can also be used as an anchor for entire dental prostheses. • Hide your smile because of spaces from missing teeth? • Feel your dentures are not secure? • Wish you could smile, speak and eat in comfort and with confidence, but are missing one or more teeth? If so, then dental implants could be for you. Dental implants can replace any number of teeth, from a single tooth to a complete set. As a practice we are now able to offer a free no obligation consultation for patients with Georgios Lazaridis. To book an appointment please call 01225 703232.